The following photos are available for use in conjunction with articles in the Play Fair 2008 campaign. Are you planning events to help raise awareness of the need for Olympic movement and the sportswear industry to ensure respect for labor rights where their products are made? Make use of the following Play Fair 2008 materials to spread the word! Play Fair 2008 has developed an eight-page brochure to be used in public awareness raising. Distribute these brochures to other organizations in your networks to get them involved in the campaign, also make use of these colorful publications to reach out to the public. 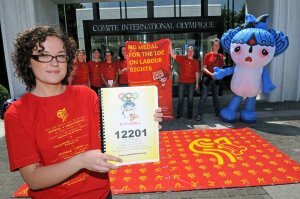 Each brochure, featuring the labour rights fuwas, includes a detachable postcard that people can send to IOC president Jacques Rogge to voice their concerns. The brochure is available in Engish, Frensh, Spanish, German and Chinese. Please note that these files are big. They are ready to be printed. 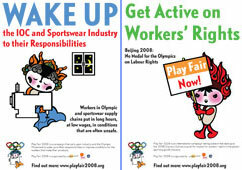 Play Fair 2008 has developed two A2 format posters that feature the labour rights fuwas. Both posters are available in English, French, Spanish, German and Chinese. Specific action to be taken by the Olympic Family, the sportswear industry and governments to act on their responsibility to ensure good conditions in Olympic and sportswear supply chains.